What do I call this move to start my review? 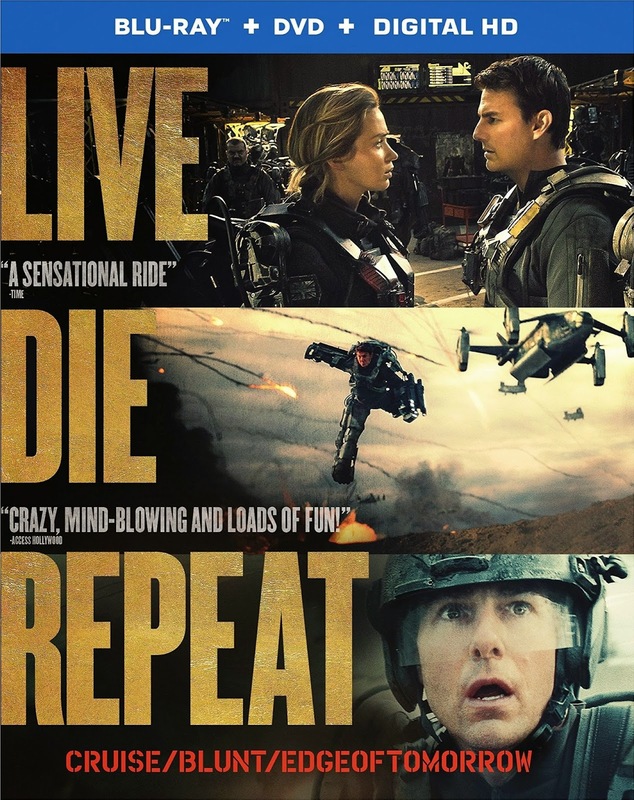 I ask because even though it came out in theaters as "Edge of Tomorrow" and its credits still officially show it as that, on DVD it has been marketed as "Live, Die, Repeat: Edge of Tomorrow" for reasons that seem to be vague but relate to marketing it better. This is somewhat hilarious as the movie is of course based on a manga (which was based on a novel) which had its own different name--"All you Need Is Kill" which for my money is probably the best title. Still, the fact this was based on a comic wasn't really played-up in the advertising for the movie, instead the focus was put on how we get to see Tom Cruise in the high-concept of it being like the classic movie, "Groundhog Day," but with a sci-fi bent and aliens. Speaking of Tom Crusie, he can bug me when not used properly. I like him in the Mission Impossible movies but he seems hard to utilize at times. "Edge of Tomorrow" actually uses this well, playing-up the idea of him being a generic handsome press-guy who helps promote the war against the aliens but in fact has no combat experience himself. It is kind of meta-fictional in it going, "Hey, I'm just the pretty face who is also a bit of a jerk, I don't actually fight!" considering how in real-life Tom Cruise often comes off as just being a pretty face who is a bit of a jerk on occasion. 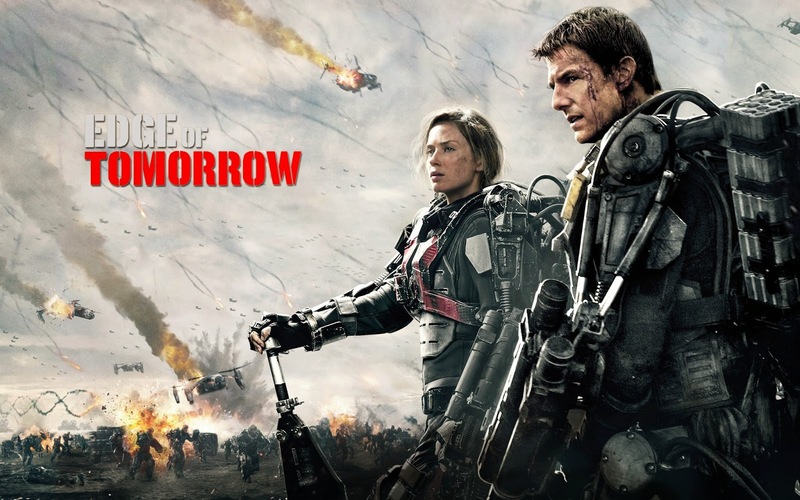 Anyways, with that rant about Cruise finished, how is "Edge of Tomorrow" as a movie? Pretty good, but not as amazing as some folk have made it out to be. 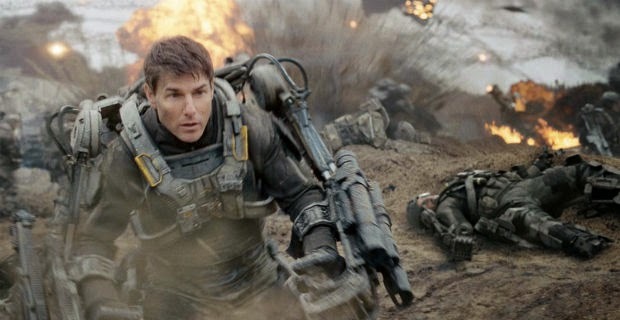 I saw many articles about how "Edge of Tomorrow" was one of the best movies Cruise has done in awhile and that it was a shame it didn't make as much at the box office as it should have, and I agree it is an enjoyable flick, but for everything I liked there often was something that bugged me. The whole concept of why Cruise keeps living the day over and over--with it resetting anytime he dies is given a quick explanation at one point in the movie with any questions basically hand-waved away with a, "It's future-science, don't ask," sort of response. Then again, even if the "why" of the movie doesn't make sense at the least the actual resetting of the days brings about some interesting results. Cruise's character of course tries the usual idea of claiming he knows what is going to happen but as one of the few characters who believe him at the start point out, saying you know the future and having some minimal proof will probably just get you put in the Psych Ward by those who don't believe you, and/or getting dissected by those who do and want to figure out how you know what's going on. This results in Cruise and the battle-hardened soldier who trains him (played expertly by Emily Blunt) working to try and figure out a way to actually beat the aliens. There are some other soldiers who help at points too, but they get so little character development it is hard to care about them besides a mean sergeant played as delightfully unhinged by Bill Paxton. The aliens also don't really get any sort of explanation for why they are invading Earth, with one scene where people actually debate it having Cruise shout out how it doesn't really matter--again, a sort-of meta response to people who would complain that the aliens lack motivation. The day resetting is cool, but doesn't make sense and even though Cruise and Emily Blunt get good character development everyone else seems inconsequential. Then, the aliens look cool but why they are attacking our planet is never explained. Everything I like has something that bugs me too (kind of like in my pseudo-review of "Destiny").One thing I loved and which doesn't have an opposite thing to bug me however would be the special effects. They are gorgeous. Whether it is a bunch of soldiers storming a beach to fight the aliens, the appearance of the aliens themselves, or all the colorful explosions, this movie is indeed a feast for the eyes. 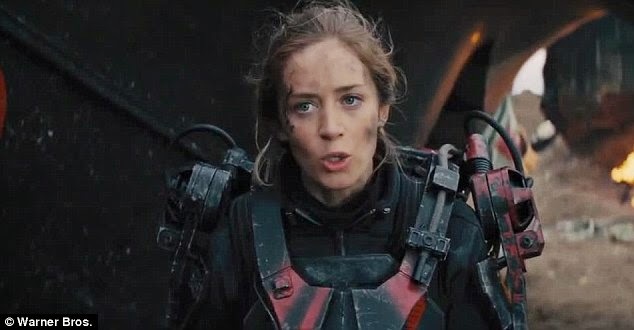 In conclusion, "Edge of Tomorrow" is a good film that I liked, but not something I would call utterly amazing due to various factors irritating me. It is still well worth a rental however as Cruise and Blunt both do a great acting job and the special effects are a hoot. As long as you don't think too hard about the plot you should be fine. If you go somewhere to rent or purchase it however good luck figuring out if it will be under, "E,"for the "Edge of Tomorrow" title or under, "L," for the "Live, Die, Repeat" title. The manga was actually based on a novel. A very good one. Skip the manga, go for the novel. I was not aware of that. I shall edit the post to reflect this. Thanks!